Question: Where and when was the idea for this painting conceived? Reply: The ‘inspiration’ came in the city of Lhasa – the capital of the Tibetan Autonomous Region, China. At the end of the 1980’s on one occasion when I was visiting Lhasa, I had a ‘moment of inspiration’, and immediately sketched the outline onto a hotel note pad. Question: What was your purpose in designing such a painting? Reply: I particularly like style of art portrayed in Nepali and Tibetan paintings. My first visit to the PRC was in 1981. On one occasion I attended a service in a Three Self Protestant Church in Beijing and was taken aback to see their pictures of Jesus and other Biblical accounts were all European in style. This surprised me. I was already very familiar with South Asian Christian art that portrayed Christian themes in a contextualized format. Moreover I had seen that Biblical themes presented in an indigenous format inspire local Christians to relate to Jesus Christ from within their own culture. Although Jesus was born into a Middle Eastern Jewish culture nevertheless he relates to people today within the confines of their own individual cultures and languages. Having been translated into 2000 different languages and dialects his teachings are widely accessible in the 21st century. Question: Why does the painting have a copyright? Reply: After describing my design to a Sherpa master thanka painter in Nepal I commissioned him to reproduce it. He did a brilliant job and quality of his art work is excellent. Unfortunately within a short time I discovered several people (who did not understand the theological integrity of the design) were planning to make copies of the picture with a few added changes and sell them worldwide for profit. In order to preserve the artistic quality of the original painting and to maintain its theological integrity I immediately put a copyright on it. This worldwide copyright was renewed in 2002. Question: I have read that a Nepali painter in Pokhara (Nepal) is reproducing and selling ‘look alike’ thankas. Did you authorise him to do this? Reply: No. *This painter is selling fraudulent reproductions for profit. His reproductions are inferior in quality and changes to some of the details are problematic. The depiction of Jesus’ ascension may cause some observers to assume the ascension was to a Buddhist ‘heavenly’ realm in order to attain enlightenment. 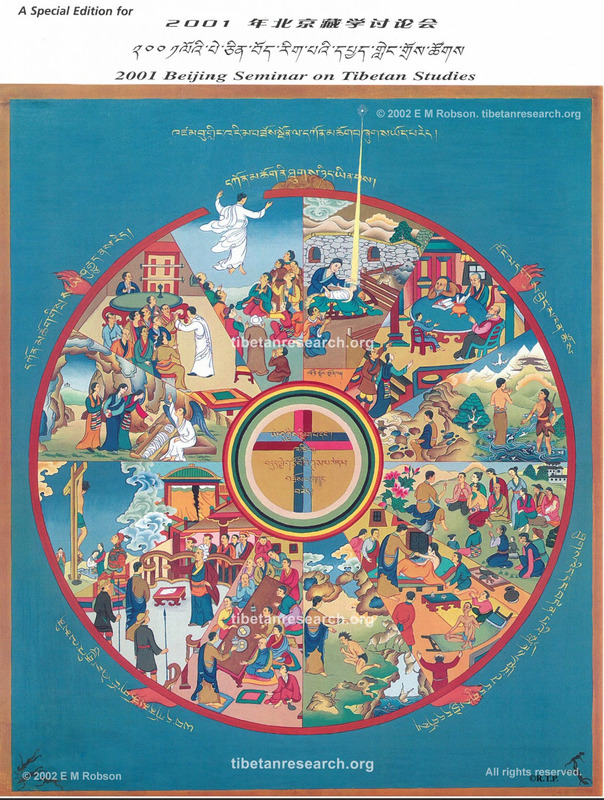 All the explanations in Tibetan are missing from his reproductions. *I have been told (although I have not seen it yet) another unauthorized copy of the original has been produced in Ladakh, N India. *Prints of another unauthorized copy were distributed in Mongolia during the 1990’s until the copyright was enforced. It is disappointing that there are people who disrespect the intellectual property of others and deliberately flout copyrights for personal gain. Now that a scan of the genuine and original painting is visible on this website you will not be deceived should you come across a fraudulent copy. To request a print please send us your full postal address via the message box on this website.